It was another tumultuous year politically around the world. Prime Minister Rajiv Gandhi was assassinated in India. Boris Yeltsin became the first democratically elected President of Russia. Operation Desert Storm liberated Kuwait. A South African referendum brings an official end to Apartheid. Lech Walesa was elected President of Poland. The Rodney King police beating shocks people around the world. Albums like "Apocalypse '91" and "Death Certificate" reflected the anger and distrust that urban communities felt toward the police both before and after King's beating. 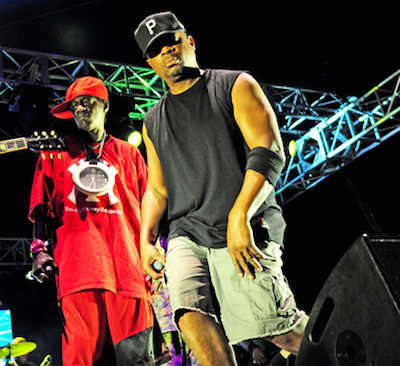 The video for Public Enemy's "Can't Truss It" struck a nerve for many people. For me it was a whole new respective on employment at a time when I was just breaking into the working world as a teenager, with the video drawing a direct analogy between slavery and wage slavery - the conditions of the field and the factory and even the "bosses" being exactly the same. It was also the first time rap music managed to offend my father, as he yelled at me to "turn that s#%! OFF" after I watched a Public Enemy tape with the video on it. A powerful, pivotal moment in my life for so many reasons. I still have that tape 20+ years later, and for that reason among many others, it's my #1 video of 1991. 1.) Public Enemy - "Can't Truss It"
2.) Geto Boys - "Mind Playing Tricks On Me"
3.) A Tribe Called Quest - "Scenario"
4.) Black Sheep - "The Choice Is Yours"
5.) Ice Cube - "Steady Mobbin'"
6.) Ice-T - "New Jack Hustler"
7.) DJ Quik - "Tonite"
8.) Gang Starr - "Just to Get a Rep"
9.) 2Pac - "If My Homie Calls"
10.) Naughty By Nature - "Uptown Anthem"
11.) DJ Jazzy Jeff & The Fresh Prince - "Summertime"
12.) Ed O.G. & Da Bulldogs (Edo.G) - "I Got to Have It"
13.) Del Tha Dunkee Homosapien - "Mistadobalina"
14.) MC Breed & DFC - "Ain't No Future in Yo' Frontin'"
15.) Nikki D - "Daddy's Little Girl"